There are few things more exhilarating, more relaxing, and more widely loved than camping. It doesn’t matter if you live in the city or in the country, millions of Americans from all corners of the country love camping. And, along with this universal love of camping, there also comes a universal need for quality outdoor equipment, including adequate outdoor shelter. This article covers all of your options and provides a few insights on canvas tents for camping. That is where we come in. You see, everyone needs to have shelter, it is one of the basic needs of all human beings. When it comes to camping shelters, outdoors-men and women have lots of options including trailer-campers, tents, bivy sacs, and so on. However, today we are going to talk about the tried, tested, and loved tent. Not only are they versatile and movable, but they have also been a part of human culture for thousands of years. However, there is a slight problem that one runs into with tents and that is durability. When people opt for the cheapest tent they can find they tend to get tents that aren’t durable and won’t last very long, but we are getting ahead of ourselves. Today we are going to talk about good tents, and we mean really good tents—canvas camping tents and what you are missing if you choose to go with a cheap dome tent from a department store. If you hate reading, let me skip to the end –> canvas tents make for far better camping. Check out our Our Shop now! Most camping trips that involve a dome tent are going to be very uncomfortable. Not only is the sleep capacity a lie (we all know that when that dome tent says it sleeps two people it really only sleeps ¾ of a person), but they are also very awkwardly built. Most people can’t stand up in a dome tent, which makes changing your clothes or packing nearly impossible. For comparison, check out our sleeping capacity guide for canvas wall tents. Another problem with those dome tents is that they also don’t have room for you to keep your gear in there with you. So, if you have brought expensive stuff with you on your camping trip, you are going to have to leave it outside or in the car instead of inside the tent with you. This can be frustrating if you have things that you will need in the middle of the night, or just things you don’t want to be damaged or stolen. Let’s face it, department store dome tents don’t hold out the water like they are supposed to. Even those with rainflies are hardly ever good at keeping the rain out of your tent. Even in the best waterproof dome tents available, condensation still leads to a wet experience. 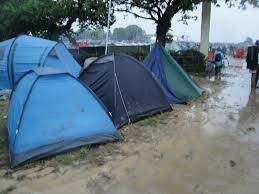 Anyone who has ever experienced a wet tent will tell you, that is the worst thing in the world! 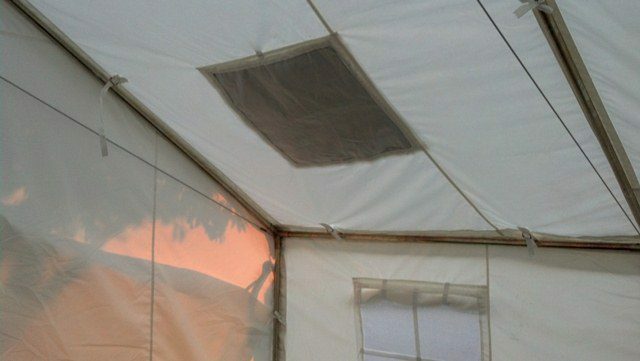 Another problem that you see quite often with cheap dome tents is that they are very susceptible to tearing. It doesn’t take much put a hole in one of their walls, rendering it unsightly and almost useless. When you look at the costs in the long run, something we will do more in detail in just a moment, a cheap tent can cost you the same, if not more, than a higher quality tent. For a comparison of the costs of our canvas tents vs. those elsewhere, check out this chart. 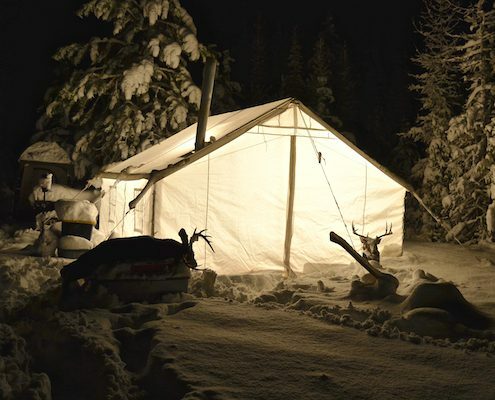 A canvas tent remedies these issues by having a greater amount of space to move about and store gear, a thicker material that naturally repels water, and a stronger material that can withstand most ripping and tearing. Plus, in the long run they practically pay for themselves. 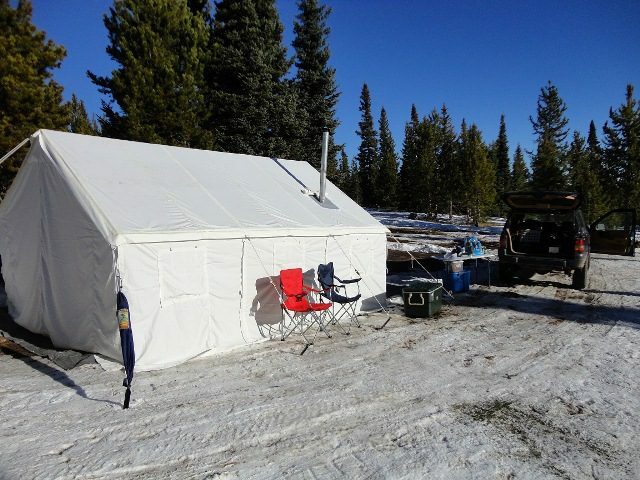 When you buy a canvas tent you are investing in your outdoors future, and it pays off! 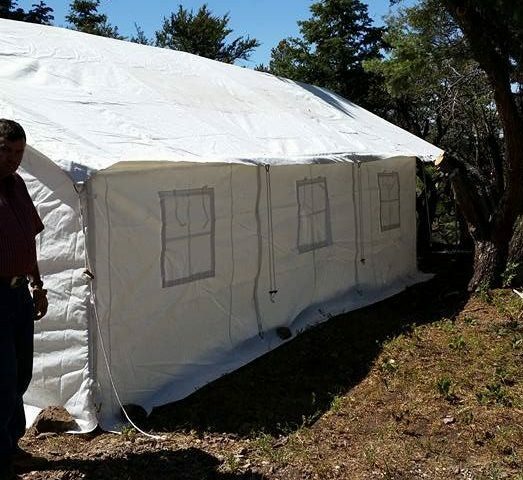 Here at Elk Mountain Tents, we pride ourselves on providing the average outdoors-man and woman with the solution to the drawbacks seen in dome tents while also addressing even more concerns seen with traditional cotton canvas. Our unique synthetic canvas is better than traditional canvas. These low-cost, rugged tents are some of the best you can find on the market, offering you many great benefits. One of the amazing qualities of polyester canvas tents is that they last for a very long time. They won’t tear like a cheap dome tent, nor will they shrink like comparably sized cotton canvas tents. Plus, they have a higher rip and tear strength (see the tent features section on our site). A polyester canvas tent is the last tent you will ever have to buy because it will be with you and your family for a lifetime. As a natural extension of the previous section, we have to say that you can count on our tents. You don’t have to worry about whether your tent is going to be in shape for this year’s hunting or camping trips; they will always be ready. Just check our our reviews on our website or those on Facebook or Amazon. Part of the reason that our tents last so long is the fact that they hold up well to the wind and the rain. As any outdoors-man or woman will know, Mother Nature can be pretty fierce and knowing that your tent will be able to stand up to that ferocity is peace of mind that you can’t put a price tag on. 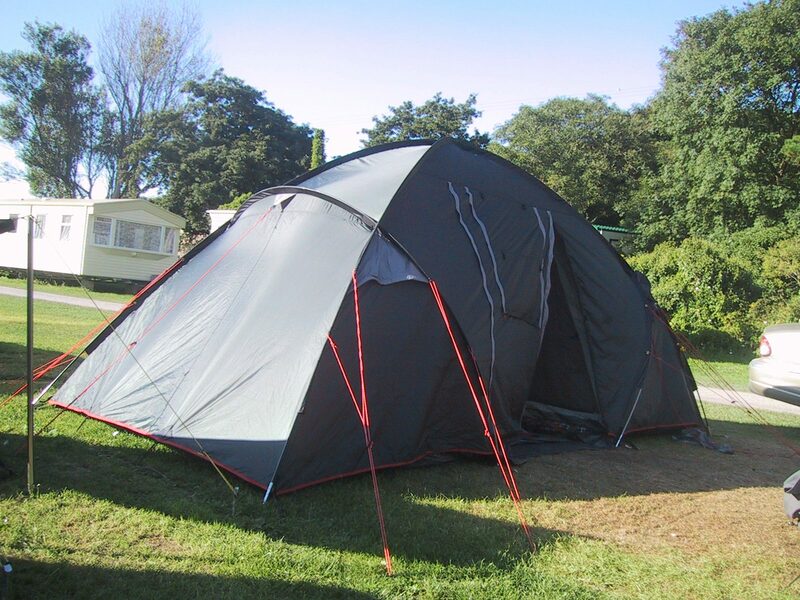 Naturally strong material, extra long and strong stakes, durable tie-downs and tensioners – your tent is secure! If you’re interested in the details and specs of our superior fabric, check out our FAQ page. 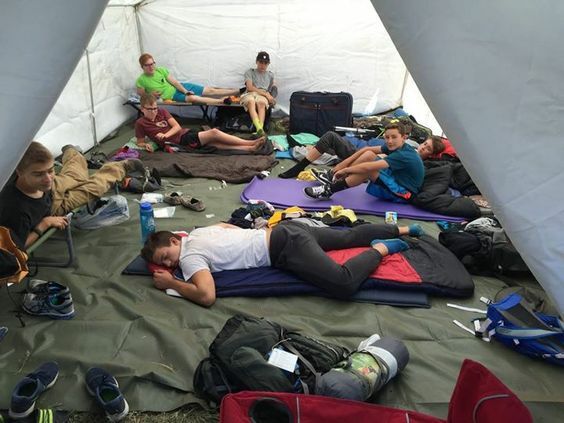 No matter how much gear you bring, or how many friends come along, you won’t feel cramped in an Elk Mountain Tent. You will be able to stand up straight and move around in comfort instead of being hunched over as you are trying to change your clothes. Our tents are so comfortable, that they are even being used for glamping! When you buy the basic 13 x 13 tent it will have 4 windows. However, if you buy a bigger size, you will have 6 windows to work with, giving you maximum ventilation. These windows have Velcro seals to keep them closed when they aren’t in use so you won’t have to worry about them flying in the breeze. There are few things better than having a warm tent to come back to at night, and that is why our tents have stove jacks with 4, 5, and 6 inch circles sewn in making it easy to bring your stove with you on your next excursion. As would be expected from a polyester canvas tent, they are waterproof making them ideal for even the most wet destination. Want to take a trip to the Oregon Coast? What about New England? No problem. Our tents will handle them like champs. 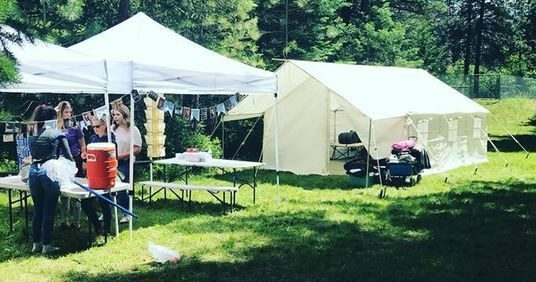 Although our tents do just fine the way they are, some people prefer to ensure their investment with a rainfly or providing additional Nikwax treatment. Having the right tent for your outdoor adventure is of vital importance and that is exactly why we make the most versatile and affordable tents in the business. Check out our full features list and our videos to learn more about what we are all about or give us a call or shoot us an email, we are always happy to help.